Rescue workers in northern California are using cadaver-sniffing dogs to search for bodies in the ruins of homes burned to the ground by wildfires. The fires north of San Francisco have killed 31 people since Sunday, and 900 people are officially listed as missing. Sonoma County Sheriff Robert Giordano said identifying fire victims would be hard. "We have found bodies that are almost completely intact and we have found bodies that are nothing more than ash and bones," he said. "One of the ways we make IDs in those cases is through medical devices ... where there is a piece of metal left from somebody's surgery, like a hip replacement with an ID number on it." On Thursday, firefighters gained some ground against the raging infernos, but as dawn broke Friday, they faced another tough day with low humidity and strong winds expected to return. Twenty-two fires were burning Thursday, with firefighters partially containing just one. More than 75,000 hectares (185,300 acres) have burned so far, including some of Northern California's world-famous vineyards and wineries. At least 3,500 homes and businesses have been destroyed. By Friday morning, California Department of Forestry and Fire Protection spokesman Scott McLean said the fires burning in Sonoma and Napa counties are about 22 percent contained. All that remained of some neighborhoods are a few blackened chimneys, charred trees and burned-out cars. About 8,000 firefighters from California and as far away as Canada and Australia were hard at work. 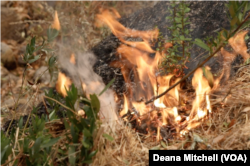 The strong, dry Santa Ana winds that blow down from the mountains every late summer and early fall were creating conditions that made their job extremely hard. But the deputy chief for California's fire protection team, Barry Biermann, was a bit more optimistic Thursday. "As more and more resources come in, we will continue to get additional containment on these fires. Those numbers will start to go up, and we're hoping that the weather continues to cooperate and be mild and allow us the opportunity to make good progress," Biermann said. Authorities did not have an exact cause of the fires, but said anything from a downed power line to a thoughtlessly tossed cigarette could have started them. Police blocked off many roads and prevented people from going into the destroyed neighborhoods, where some people said they no longer recognized streets and surroundings. But Dave Larson of Glen Ellen sneaked into his destroyed neighborhood to look for his cats and to see whether any of his neighbors' homes still stood. He knew his was gone. "This to me is like a nuclear bomb went off," Larson said near his home. "I've woken up the last two mornings, thinking it was maybe a dream, but then I realized I have nothing. I have someone else's clothes now. It's bizarre having nothing." 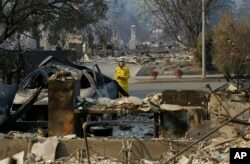 A California Fire Department forester inspects damage at homes destroyed by fires in Santa Rosa, Calif., Oct. 12, 2017. As he surveyed the damage, he marveled at how some of his neighbors' homes survived. He said he regretted that he hadn't stayed, like his neighbors, standing on the roof with his hose and fighting the fire himself. Larson's classic car collection was a smoldering heap of metal. And his antiques were gone. But he found something of sentimental value propped up against his melted flat screen TV: his grandfather's 100-year-old rifle, a memento from World War II. The gun, covered in soot and ash, looked like a burnt stick, although its bayonet was still intact. Larson said he wished he had grabbed the gun as he left. Michelle Quinn and Deana Mitchell contributed to this report.